DeLoss Dodds, left, the University of Texas director of athletics presents world champion decathlete Trey Hardee with the Academy’s Jim Thorpe All-Around Award. World champion decathlete Trey Hardee of the United States has been named the winner of the Jim Thorpe All-Around Award by the United States Sports Academy. 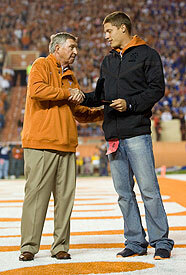 Hardee was presented with the award by Texas director of athletics DeLoss Dodds, a past winner of the Academy’s Carl Maddox Sports Management Award, during a presentation at the Texas-Kansas football game on 21 November. Hardee’s victory at the world championships in Berlin in August was a career-defining moment. Nearly one year after not finishing the decathlon during the Beijing Olympics because of misses in the pole vault, Hardee rebounded in a glorious way. He finished with a career-best total of 8,790 points at the world championships and set personal records in three events: long jump, shot put and javelin throw. The native of Birmingham, Ala. was the 2006 National Collegiate Athletic Association (NCAA) Division I Men’s Indoor Field Athlete of the Year while competing for the University of Texas. He was also the 2005 NCAA Outdoor champion and 2004 Outdoor runner-up and current NCAA decathlon record-holder. The Jim Thorpe All-Around Award is presented to an individual who has demonstrated outstanding achievement in multiple sports and/or multiple events of the same sport. This individual should exhibit the qualities of versatility, strength, speed, flexibility, conditioning and training that exemplify superior athletic prowess. Past winners of the Thorpe All-Around Award include Deion Sanders, Herschel Walker, Willie Gault, Danny Ainge, Julius Peppers and Brian Clay.